Last year I traveled to South Korea to give presentations on nonlinear structural equation modeling and WarpPLS (). These are an advanced statistical analysis technique and related software tool, respectively, which have been used extensively in this blog to analyze health data, notably data related to the China Study. I gave a couple of presentations at Korea University, which is in Seoul, and a keynote address at a conference in Gwangju, in the south part of the country. So I ended up seeing quite a lot of this beautiful country, and meeting many people. Some of my impressions regarding health and lifestyle issues need separate blog posts, which are forthcoming. One issue that kept me thinking, as it did when I visited Japan a few years ago as well, was the obvious leanness of the South Koreans, compared with Americans, even though you don’t see a lot of emphasis on dieting there. Interestingly, this phenomenon also poses a challenge to many dietary schools of thought. For example, consumption of high-glycemic-index carbohydrates seems to be relatively high in South Korea. The relative leanness of South Koreans is probably due to a combination of factors. A major one, it seems, is often forgotten. It is related to epigenetics. This term, “epigenetics”, is often assigned different meanings depending on the context in which it is used. Here it is used to refer to innate predispositions that don’t have a primarily genetic basis. Epigenetic phenomena often give the impression that acquired characteristics can be inherited, and are frequently, and misguidedly, used as examples in support of a theory often associated with Jean-Baptiste Pierre Antoine de Monet, better known as Lamarck. A classic example of epigenetics, in this context, is that of a mother with type II diabetes giving birth to a child that will develop type II diabetes at a young age. Typically type II diabetes develops in adults, but its incidence in children has been increasing lately, particularly in certain areas. And I think that this classic example is in part related to the general leanness of South Koreans and of people in other cultures where adoption of highly industrialized foods has been relatively slow. In other words, I think that it is possible that a major protection in South Korea, as well as in Japan and other countries, is the cultural resistance, particularly among older generations, against adopting modern diets and lifestyles that deviate from their traditional ones. This brings me to Drs. 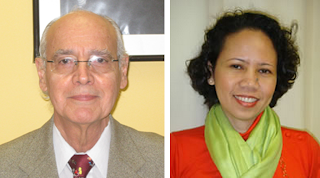 Francisco Cervantes and Marivic Torregosa (pictured below). Dr. Cervantes is the Chief Director of Laredo Pediatrics and Neonatology, a pediatrician who studied and practiced in a variety of places, including Mexico, New Jersey, and Texas. Dr. Torregosa is a colleague of mine, a college professor and nurse practitioner in Laredo, with a Ph.D. in nursing and a research interest in child obesity. As it turns out, Laredo, a city in Southwestern Texas near the border with Mexico, seems like the opposite of South Korea in terms of health, and this may well be related to epigenetics. This presents an enormous opportunity for research, and for helping people who really need help. In Laredo, as well as in other areas where insulin resistance and type II diabetes are rampant, there is a great deal of variation in health. There are very healthy folks in Laredo, and very sick ones. This great deal of variation is very useful in the identification of causative factors through advanced statistical analyses. Lack of variation tends to have the opposite effect, often “hiding” causative effects. Drs. Cervantes, Torregosa, and I had a presentation accepted for the 2013 Ancestral Health Symposium (). It is titled “Gallbladder Disease in Children: Separating Myths from Facts”. It is entirely based on data collected and analyzed by Dr. Cervantes, who is very knowledgeable about statistics. Below is the abstract. Cholesterol’s main role in the body is to serve as raw material for bile acids; the conversion of cholesterol to bile acids by the liver accounts for approximately 70 percent of the daily disposal of cholesterol. Bile acids are then stored in the gallbladder and secreted to aid in the digestion of dietary fat. It is often believed that high cholesterol levels cause gallbladder disease. In this presentation, we will discuss various aspects of gallbladder disease, with a focus on children. The presentation will be based on data from 2116 patients of the Laredo Pediatrics & Neonatology. The patients, 1041 boys and 1075 girls, are largely first generation American-born children of Hispanic descent; a group at very high risk of developing gallbladder disease. This presentation will dispel several myths, and lay out a case for a strong association between gallbladder disease and abnormally high body fat levels. Gallbladder disease appears to be largely preventable in children through diet and lifestyle modifications, some of which will be discussed during the presentation. Many people seem to be unaware of the fact that cholesterol production and disposal are strongly associated with secretion of bile acids. Most of the body's cholesterol is used to produce bile acids, which are reabsorbed from the gut, in a cyclical process. This is the reason behind the use of "bile acid sequestrants" to reduce cholesterol levels. The focus on gallbladder disease in the presentation comes from an interest by Dr. Cervantes, based on his many years of clinical experience, in using gallbladder disease markers to identify and prevent other conditions, including several conditions associated with what we refer to as diseases of affluence or civilization. Dr. Cervantes is unique among clinical practitioners in that he spends a lot of time analyzing data from his patients. His knowledge of data analyses techniques rivals that of many professional researchers I know. And he does that at his own expense, something that most clinical practitioners are unwilling to do. Dr. Cervantes and I will be co-authoring blog posts here in the future. A new study linking sugar consumption with diabetes prevalence has gained significant media attention recently. The study was published in February 2013 in the journal PLoS ONE (). The authors are Sanjay Basu, Paula Yoffe, Nancy Hills and Robert H. Lustig. Among the claims made by the media is that “… sugar consumption — independent of obesity — is a major factor behind the recent global pandemic of type 2 diabetes” (). As it turns out, the effects revealed by the study seem to be very small, which may actually be a side effect of data aggregation; I will discuss this further below. Let me start by saying that this study also included in the analysis the main natural source of sugar, fruit, as a competing variable (competing with the effects of sugar itself), and found it to be unrelated to diabetes. 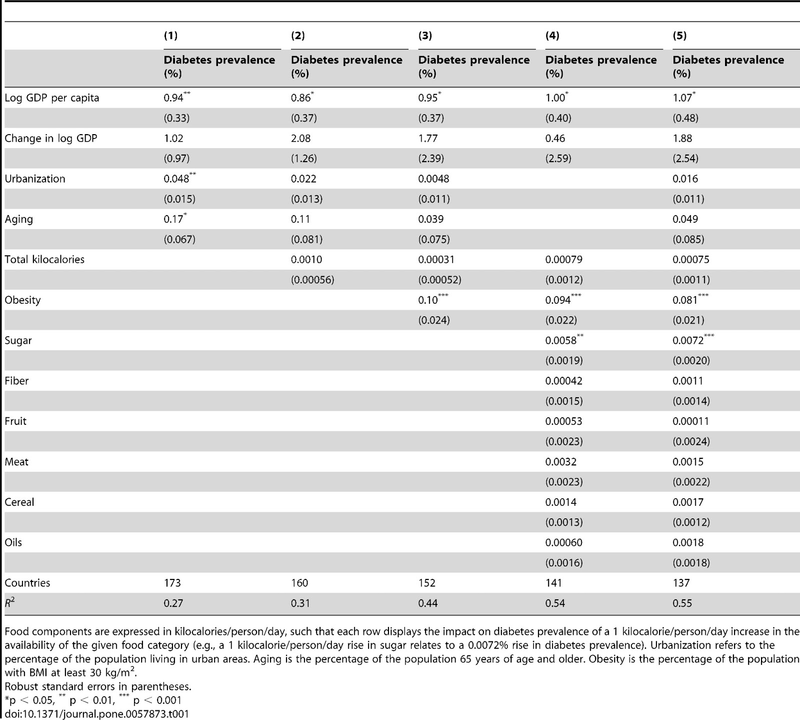 As the authors note: “None of the other food categories — including fiber-containing foods (pulses, nuts, vegetables, roots, tubers), fruits, meats, cereals, and oils — had a significant association with diabetes prevalence rates”. This should not surprise anyone who has actually met and talked with Dr. Lustig, the senior author of the study and a very accessible man who has been reaching out to the public in a way that few in his position do. He is a clinician and senior researcher affiliated with a major university; public outreach, in the highly visible way that he does it, is probably something that he does primarily (if not solely) to help people. Dr. Lustig was at the 2012 Ancestral Health Symposium, and he told me, and anyone who asked him, that sugar in industrialized foods was his target, not sugar in fruits. As I noted here before, the sugar combination of fruits, in their natural package, may in fact be health-promoting (). The natural package probably promotes enough satiety to prevent overconsumption. The Diabetes Report Card 2012 () provides a wealth of information that can be useful as a background for our discussion here. In the USA, general diabetes prevalence varies depending on state, with some states having higher prevalence than others. The vast majority of diabetes cases are of type 2 diabetes, which is widely believed to be strongly associated with obesity. In 2012, the diabetes prevalence among adults (aged 20 years or older) in Texas was 9.8 percent. This rate is relatively high compared to other states, although lower than in some. So, among a random group of 1,000 adult Texans, you would find approximately 98 with diabetes. Prevalence increases with age. Among USA adults in general, prevalence of diabetes is 2.6 percent within ages 20–44, 11.7 percent within ages 45–64, and 18.9 percent at age 64 or older. So the numbers above for Texas, and prevalence in almost any population, are also a reflection of age distribution in the population. According to the 2013 study published in PLoS ONE, a 1 percent increase in obesity prevalence is associated with a 0.081 percent increase in diabetes prevalence. This comes directly from the table below, fifth column on the right. That is the column for the model that includes all of the variables listed on the left. We can translate the findings above in more meaningful terms by referring to hypothetical groups of 1,000 people. Let us say we have two groups of 1,000 people. In one of them we have 200 obese people (20 percent); and no obese person in the other. We would find only between 1 and 2 people with diabetes in the group with 200 obese people. 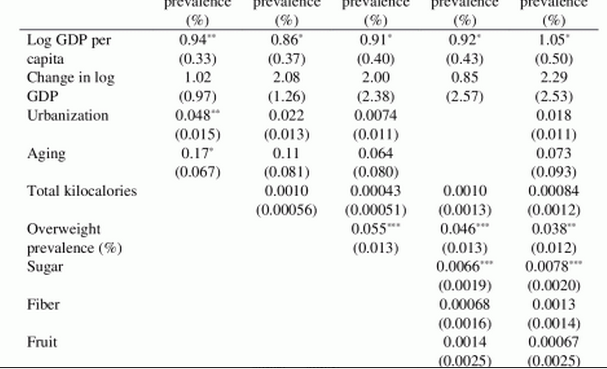 The authors also considered overweight prevalence as a cause of diabetes prevalence. 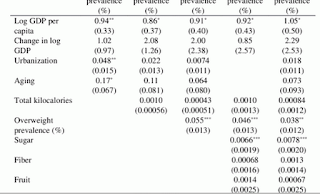 A section of the table with the corresponding results in included below. They also found a significant effect, of smaller size than for obesity – which itself is a small effect. The study also suggests that consumption of the sugar equivalent of a 12 oz. can of regular soft drink per person per day was associated with a 1.1 percent rise in diabetes prevalence. The effect here is about the same as that of a 1 percent increase in obesity. That is, let us say we have two groups of 1,000 people. In one of them we have 200 people (20 percent) consuming one 12 oz. can of soft drink per day; and no one consuming sugar in the other. (Sugar from fruits is not considered here.) We would find only about 2 people with diabetes in the group with 200 sugary soda drinkers. In other words, the effects revealed by this study are very small. They are so small that their corresponding effect sizes make them borderline irrelevant for predictions at the individual level. 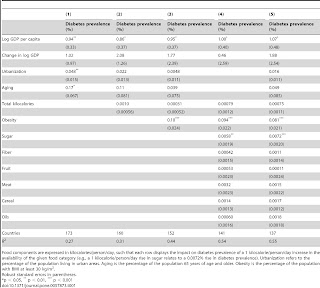 Based on this study, obesity and sugar consumption combined would account for no more than 5 out of each 100 cases of diabetes (a generous estimate, based on the results discussed above). Even being weak, the effects revealed by this study are not irrelevant for policy-making, because policies tend to influence the behavior of very large numbers of people. For example, if the number of people that could be influenced by policies to curb consumption of refined sugar were 100 million, the number of cases of diabetes that could be prevented would be 200 thousand, notwithstanding the weak effects revealed by this study. Why are the effects so small? The effects in this study are based on data aggregated by country. When data is aggregated by population, the level of variation in the data is reduced; sometimes dramatically, a problem that is proportional to the level of aggregation (e.g., the problem is greater for country aggregation than for city aggregation). Because there can be no association without correlation, and no correlation without variation, coefficients of association tend to be reduced when data aggregation occurs. This is, in my view, the real problem behind what statisticians often refer to, in “statospeech”, as “ecological fallacy”. The effects in aggregated data are weaker than the effects one would get without aggregation. So, I suspect that the effects in this study, which are fairly weak at the level of aggregation used (the country level), reflect much stronger effects at the individual level of analysis. Should you avoid getting obese? Should you avoid consuming industrialized products with added sugar? I think so, and I would still have recommended these without this study. There seems to be no problem with natural foods containing sugar, such as fruits. This study shows evidence that sugar in industrialized foods is associated with diabetes, independently from obesity, but it does not provide evidence that obesity doesn’t matter. It shows that both matter, independently of one another, which is an interesting finding that backs up Dr. Lustig’s calls for policies to specifically curb refined sugar consumption. Again, what the study refers to as sugar, as availability but implying consumption, seems to refer mostly to industrialized foods where sugar was added to make them more enticing. Fruit consumption was also included in the study, and found to have no significant effect on diabetes prevalence. Here is a more interesting question. If a group of people have a predisposition toward developing diabetes, due to any reason (genetic, epigenetic, environmental), what would be the probability that they would develop diabetes if they became obese and/or consumed unnatural sugar-added foods? This type of question can be answered with a moderating effects analysis, but as I noted here before (), moderating effects analyses are not conducted in health research.